Solid, all-round bushcraft/survival knife. My go-to bush blade. Heavy enough to do most anything and lives in my pack. This knife is perfect for all but the most delicate carving tasks, and I would steer folks to this blade as a budget version of a heavy duty blade that's ready to go! No modifications are necessary. Everything about this knife just works. 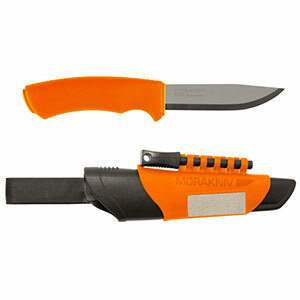 I've used multiple Morakniv knives and so far, this is superior to the ones I've used. 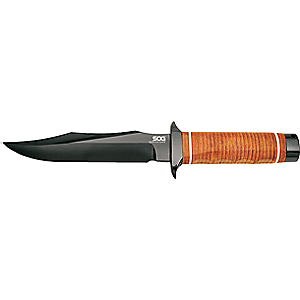 I teach basic survival programs and this is one of the knives I suggest for the people that really dig taking this kind of training further. 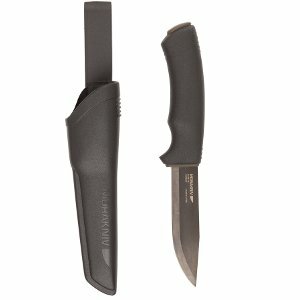 I supply the group with Morakniv 511's, which are great, but this is much better. The handle feels great and I find sticks to the hand well when wet (which is normal here in the coastal rainforest of Canada). The sharpened spine works great to shower sparks from a ferro road and for scraping bark to make tinder. It's so sharp in fact the first time I slid my finger along the edge of the spine I cut myself, so be aware of that. Like all scandi grind knives, it's super easy to sharpen and is hair splitting sharp in short order. I've been using this blade now for two years as of July 2017 and it's never let me down. The spine is still relatively sharp and I've not done anything to it to keep it that way. The only dull part of the spine is where I strike my ferro rod regularly, and it still does that well. I live in the temperate rainforest of Canada and this knife sees a lot of use, whether that's on my own trips out or when I'm teaching students how to live in the wild. My only issues with the knife are the plastic sheath is awful, even though it works. This is par for the course with this type of knife though. All my Moras come with these plastic sheaths that I just don't like. The colour black, though it looks sharp, is a pain if you set the blade down and blends in well with the ground. I wish they made this knife in orange. The stainless steel version comes in orange, just not the carbon steel. You'll make feather sticks, carve notches, split wood, and more with this knife. It's perfect for camping, backpacking (except UL), hiking, bushcrafting, etc. Nice review, Brady! Thanks for taking the time to share it and your experience with this Morakniv with everyone. If you have some pictures of yours in use, those would be great to see in your review. This is an excellent knife. I have used mine for so many tasks such as skinning, making bark baskets, carving tent stakes, etc. It's a tough and versatile blade which holds a very nice edge. I recommend this knife for anyone who wants a good all purpose knife. This knife does have a hidden tang. If you beat it up in a manner that you might a knife with a full tang, you may be disappointed. 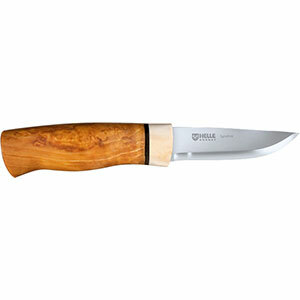 Other than that, this is a very durable and reliable knife if used properly. I have had mine a year and am still happy with it. The handle is very comfortable and has a non slip grip. 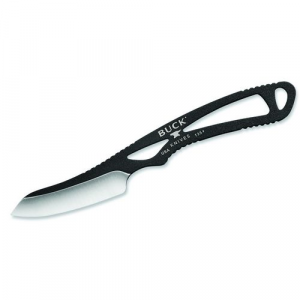 The special black coating on the carbon steel blade keeps the blade rust free with almost no maintenance. If you don't clean the blade after wet use, you can sometimes see a little rust form down where the tang disappears into the handle. A little wipe with oil fixes that. The model I have is the one with the added sheath features. 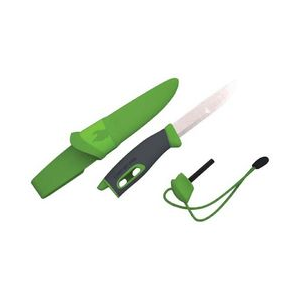 These features are the built in diamond sharpener and the detachable fire steel. The fire steel is by Light My Fire, their Scout model, and so is of good quality. It is worth getting it with the extra features on the sheath if you want a "grab and go" knife to throw in your pack. 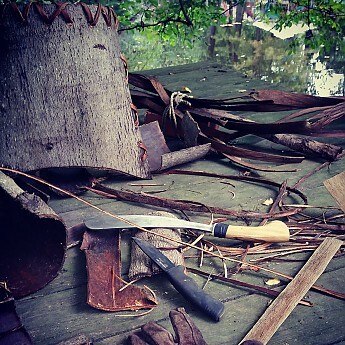 The black colored knife in the foreground is my Morakniv Bushcraft Black. It was used in 2/3's of the work shown in the pic. Welcome to Trailspace, Steven! Thanks for sharing your Morakniv review with us. I'd love to see some pictures of your knife, if you're willing to add them to your helpful review. Alicia, I edited my review to include a pic, thanks. Cool picture, Steven! Thanks for sharing it. Very solid knife for use anywhere. I really like this knife. It's solid and will hold up well to years of abuse. I've had a ton of knives. I finally got one that doesn't fold and I'm glad I did. This knife can be beaten with not much more than a scratch. It's not compact but has many backcountry applications that I can't use my Gerber for. It will have to be taken care of because the blade is carbon steel. I've owned mine for about 3 months now and I haven't had any issues with corrosion yet. I'm a big fan of Mora knives. They hold a good edge and are inexpensive enough to have several of them around for easy reach. Between myself and my girls, I think we have five or six Moras. I agree, they have a variety of styles to suite your needs and they are relatively inexpensive, you can definitely shop them pretty cheap. Really a great knife. It's my EDC. Never let me down. Really a great knife. It's my EDC. Never let me down. My wife carries one. My dog killed a deer and I skinned it with it. Still like a RAZOR. I love the diamond sharpener.